Ok, this is getting beyond a joke. In my last post, I mapped out possible strategies for re-entry to the world of sport; a mere 268 days away, with a particular focus on soccer. Part of this was earmarking key games that I would set out as ‘must-see’. Well, United – Arsenal would absolutely fall under that category. They played each other on Sunday night. 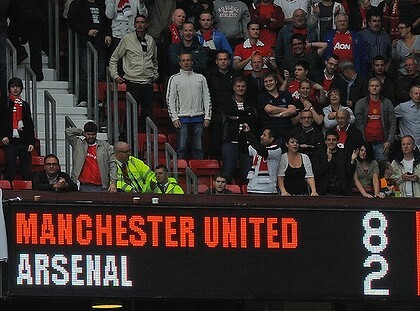 A friend texted me that night simply saying, ‘Oh my United’. My question marks were returned with the news that Man U had just decimated Arsenal to the tune of an unthinkable scoreline of 8-2. Last year, the season started off with Wayne Rooney demanding to be traded and then when he did re-sign, found it incredibly challenging to find the back of the net. Sunday night: he scored a hat trick, including two from free kicks. As I write this, I wonder how my fav, Dimitar Berbatov, fared. He normally gets in on the goals when things are going well. How would the crowd have reacted? Old Trafford would have exploded. What if it was at Emirates, Arsenal’s home turf? They would have almost rioted. Stop thinking, Pete. And I feel like I’m wavering on all this a little bit. Whenever I engage with conversations about this journey of a 12 month sabbatical from sport, it’s normally the positives that are highlighted. I guess that’s natural when you’re doing something counter-cultural. You want to talk up the good bits so you don’t come across as a failure and maybe, just maybe, to show off that this ‘ambitious counter-cultural journey is actually quite cool’, not pointless. Right now, I’m not too sure. On Saturday afternoon, without being able to watch a game due to a couple of social plans falling through, I found myself bored out of my brains with nothing to do; not exactly how I envisaged my weekend panning out. I’d finished my novel; wasn’t up for reading any of the non-fiction texts in my possession and had a wife with other things to do. At this stage, I knew that Sydney was in the process of causing one of the upsets of the AFL season, beating Geelong on their home turf; the first team to do so in 4 years. Nope, couldn’t switch that on. Sunday night, my Bombers came from behind with a flurry of goals to win a close one, yet again, and booked their place in this year’s finals in the process. Didn’t see a scrap of that either. Oh, also, one of the great Australian soccer players, Harry Kewell, has decided to play with Melbourne Victory the next 3 years. Yes I know that as his playing abilities decrease, his ego – bigger than a medium-sized suburb – increases at an equal rate, but still, that would have been good to read about, and then maybe watch a game or two next season! Ok, this is starting to sound pathetic. Time for a change of tact. If this 12 months was a breeze, there would be nothing worth writing about. There would be no credibility in it if it involved no real sacrifice on my part. It’s supposed to be hard. And … it is. And my Saturday afternoon wasn’t an entire write off. While not really tempted to turn the tv on, it was a test of discipline. Fortunately, a lawn mower needed to be returned to a friend’s, so a drink and a chat later, it was time to head off to dinner. I think you’re kidding yourself if you give in with a, ‘Just this one time,’ whether it be for this journey without sport, drinking, abstaining from watching Glee… I need strategies up my sleeve – friends, neighbours, dog walks, books, tools to return; so .. if I ask you to borrow a hammer, just know that you’re doing a community service. Soccer, yawn. Yeah ok, call me a hater….yawn. It took a while for you to have a whinge but I think this might have been it? Keep at it though, the integrity of the exercise is important and seems to still be intact.